DAT videos can be opened with programs like VCDGear and CyberLink PowerDirector but not compatible with many popular media players, in this case converting DAT videos to other popular formats becomes neccesary, while mediAvatar DAT Converter is just designed to convert DAT, VOB to AVI, DivX, MP4, MPEG1, MPEG2, MPEG4/H.264, WMV, 3GP, 3G2, FLV formats. What's more, this DivX video converter can convert MPG, MPEG, MPA to other video formats and extract MP3, M4A audio from DAT and other videos. 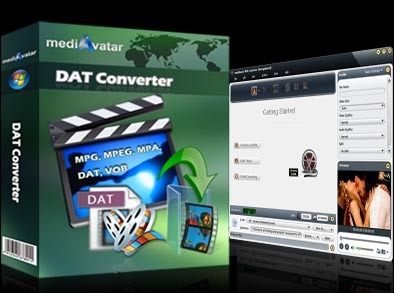 mediAvatar DAT Converter offers you much more than DAT video conversion: extract any video segment, customize the output file size, split large video files, and adjust parameters amongst others. It couldn't be easier to get DAT videos converted with high quality with this mediAvatar DAT Converter! Convert DAT, VOB videos to AVI, DivX, MP4, MPEG1, MPEG2, MPEG4/H.264, WMV, 3GP, 3G2, FLV formats; also convert MPG, MPEG, MPA videos to other video formats. Besides DAT videos conversion, also supports extracting MP3 or M4A audio from DAT, VOB, MPG, MPEG, MPA videos. This DAT converter converts DAT videos at super high speed, and the DAT video conversion could be accelerated by up to 5X with the support for multicore-CPU processing and NVIDIA CUDA & AMD APP GPU acceleration technology. Given a split time or file size, this DAT converter will automatically split and convert a DAT video into several video segments. Many parameters are ready for professional users to adjust: bit rate, frame rate, codec, resolution, quality, audio channel, and many others. Check more by downloading a demo of mediAvatar DAT Converter! It's easy to output files at any file size with this DAT converter's Bitrate Calculator tool, which can compute the video bit rate according to the file size you enter. Trim any segment by setting its start time & duration from original DAT video file and convert this segment to other video format. By adding different output formats to the same DAT video, this DAT converter gets them converted simultaneously to save time greatly. Use the built-in media player to play DAT videos before conversion to see whether you get the right video or video clip converted; and snap any video image you like during preview. In order not to affect other running applications, you can make mediAvatar DAT Converter work in background to save CPU resource. Preset this DAT video converter to auto exit, or hibernate, shut down, standby your computer after converting without waiting for the DAT to video conversion to the end. Convert Matroska (mkv) files into different formats while still maintaining high audio and video qualities. Ordinary videos are converted to HD format to play on layers that only support HD format.